Today, FIFA announced unparalleled sanctions against Barcelona for repeated and systemic violations of the international body's youth transfer rules. Barcelona has been banned from any transfer activity for the entirety of next season. This is the coup de grâce in what already has been a monumentally embarrassing season for the club's leadership. For Barcelona, this couldn't come at a worse time. The club has already seen their president, Sandro Rosell, resign amid a Spanish investigation that revealed improprieties regarding the Neymar transfer. (Barcelona announced one transfer fee, but it came out that there were a number of other payments to Neymar's dad that Spain's tax body wants a cut of.) And even that was only the boiling over of barely-concealed inner turmoil that likely led to Pep Guardiola's departure, saw club legends like Johan Cruyff ousted, and all sorts of strange political sniping that no one could understand. Then there are the effects of the ban on the pitch. If rumors are to be believed, Barcelona had already agreed on a transfer for Mönchengladbach goalkeeper Marc-André ter Stegen to fill the gloves of soon-to-be free agent Victor Valdés—whose own departure is rumored to be due, at least in part, to club politics. At this point it's unclear if that transfer will go through. Plus, there had been a feeling that after years of stagnation on the transfer front, Barça would finally buy a real center back to partner with Gerard Piqué, and maybe some midfield help to deepen an aging core. Welp, at least they'll have an excuse for when they don't fill these glaring holes for at least the 4th year running. 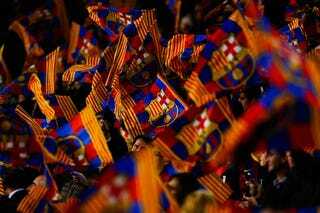 The club's board, under new president Josep Bartomeu, has tried to distance itself from Rosell's failures. However, in light of these new revelations, it's unlikely that anybody survives the coming elections. Damn, Barça. Throwing around all that money, and you couldn't find the right guy to bribe in FIFA?